Welcome to The Kana Kuta Hotel in Bali, Indonesia a family-friendly accommodation with a genuinely personal touch. This hidden treasure is located in a quiet corner of Kuta. Perfect for couples and families, our contemporary-styled hotel offers a world-class standard of hospitality and comfort. We have 92 air-conditioned guestrooms plus 2 restaurants, swimming pool, gym, kids’ corner, open-air terraces, and communal lounges. Additionally, there’s 3 multifunctional meeting rooms that spill out onto the pool terrace – ideal for weddings and events. The Balinese are renowned for their grace and hospitality, and we therefore endeavour to reflect this culture in the services we provide. 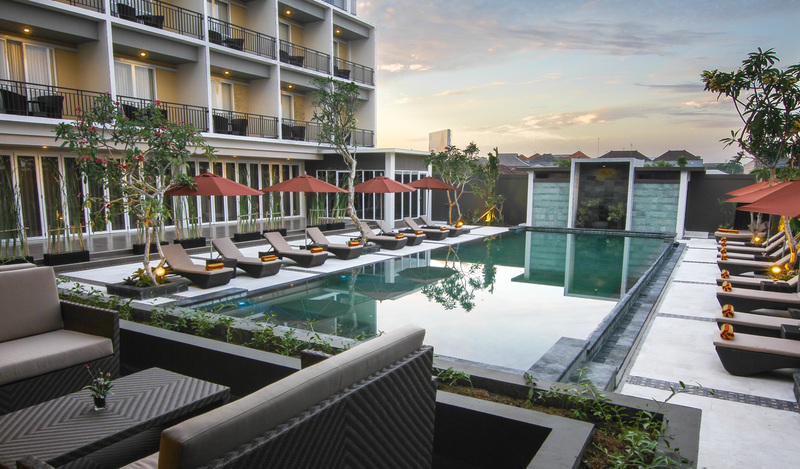 The Kana is just 5 minutes from Bali Galeria Shopping Centre, and a 15 and 20-minute drive from Kuta Beach and Ngurah Rai International Airport, respectively. We present 92 air-conditioned guestrooms that reflect the island's natural riches and designed to cater for domestic and international business and leisure travellers as well as individuals, couples, families, and groups. All guestrooms come with a flat-screen TV, dining area, private bathroom with free toiletries, and other cool amenities and freebies. The hotel provides an international standard of hospitality, contemporary architecture, comfortable accommodation, and quality facilities at affordable prices. These include 2 restaurants, a swimming pool, pool bar, gym, kid’s corner, open-air terraces, and communal lounges. Moreover, we have 3 meeting rooms with a pool terrace that can accommodate weddings and other parties. The Kana Kuta Hotel in Bali is just minutes from the famous Kuta Beach, which offers sunshine, glorious coastline views, and a busy atmosphere daily. The surrounding area offers a wide choice of shops, souvenir stalls, cafés, bars, day spas, restaurants, book stores, art shops, market stalls, and pulsating night spots.